E-Drummers waited for years for a solution like the Mimic Pro. Pearl and Steven Slate finally made a module that combines stand-alone module technology with a high-end sample library. They managed to merge a vast and professional drum library with the durability and usability of a well built e-drum module. VST guru Steven Slate said about the Mimic Pro, in the development of which he played a key role: "The Mimic Pro is a giant leap forward in drum module technology. It is a state-of-the-art touchscreen computer filled with the most detailed drum kits recorded in some of the best studios in the world. But you will not know its true power until you play it!" When we had the first Mimic Pro at our disposal in July of 2017 - flown in from the USA - and could test it for a week, we were immediately hooked: Steven Slate is right, this is a game changer! So we learned all about it and prepared for a video shoot. 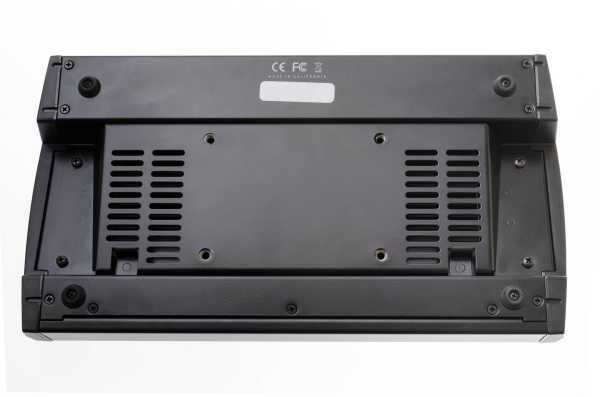 We absolutely love the ease with which the Mimic can be handled combined with the heavy duty casing. But most importantly: It is an absolute joy to play and sounds gorgeous! Need a little more to be convinced? Just watch our videos of Ralf Schumacher playing the Pearl Mimic Pro at drum-tec West and you'll see how great the Mimic responds to his inputs and how amazing it sounds: He has fun and is engaged! What's the innovation with the Pearl Mimic Pro? The yet to be reached realism of the Steven Slate Drums 5 library can completely unfold its full potential with the Mimic Pro. 60 world class drum-kits have been recorded with great attention to detail in a nuanced setup to get the most accurate and refined sounds yet. The result (in 24bit depth!) is something that previously was literally unheard of in the world of e-drums - the realism is stunning! 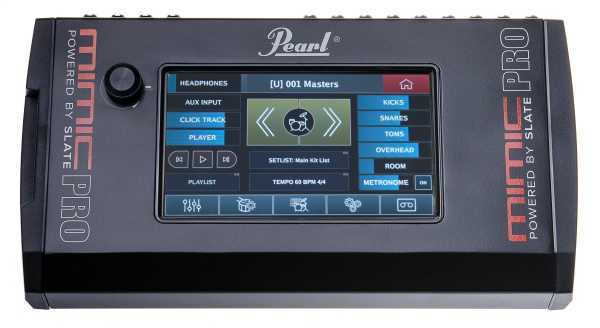 The 7" color touchscreen makes the clunky knobs from older modules obsolete and allows the drummer to navigate the powerful options of the Mimic Pro intuitively. The onboard Burr Brown converter - one of the most respected names in the scene - manages to make every nuance of your playing come alive. 16 stereo trigger inputs in combination with a professional trigger engine and the highest sensitivity allow the e-drummer to connect almost every e-drum pad or cymbal, be it Roland, drum-tec, Yamaha or Alesis (and of course Pearl's own systems). It also completely supports 2-zone and 3-zone cymbals with piezo or switch technology, except for the new Roland Digital Pads. The Pearl Mimic Pro e-drum module introduces the new Steven Slate Drums to the market: You read correctly! The Pearl Mimic Pro is powered by the Steven Slate Drums 5 library, which is otherwise not yet released. Onboard 120GB SSD drive - 60 pre-installed drum kits from the newest Steven Slate Drum library.